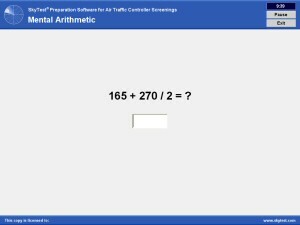 Tasks can be both visually and acoustically trained with the mental arithmetic module. You can set the time to take for each task, that is to say how many numbers should be included and to which upper limit the numbers and results should go. The possible calculation operations are addition, subtraction, multiplication, division, raising to a higher power and square rooting, and these can be combined as desired. The software will generate all task remits according to your instructions with regard to operators, number range etc. at random. This means that it is very unlikely that a certain task will be repeated which avoids the result that you may eventually know answers by heart without having to recalculate.